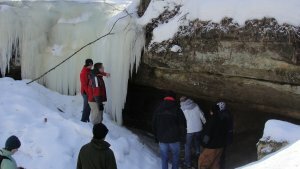 Visit spectacular ice caves and frozen waterfalls. Participants will also have the chance to try traditional and modern snowshoes. There will be lots of outdoor discoveries and depending on the hike leader, the following topics might be discussed: winter wildlife ecology, geology, biology, and history of the Kickapoo Reserve. The hike is rated moderate to difficult. Dress for the weather and don’t forget your camera! 12:30 – 4:00 pm. Instructors: Ken & Michelle Workowski. Fee: $10/Person; $9/KVR Friend; $5/Kids 12-18. Registration Deadline: February 19, 2016. Kickapoo Valley Reserve, S3661 State Hwy 131, La Farge, WI 54639 – (608) 625-2960 – http://kickapoovalley.wi.gov.